construction is moving fast and things change every day. the framing is just about done at the shop and my sister and i started priming the walls tonight. i think we're on schedule to open the first week in may. so who wants to help on painting weekend?! 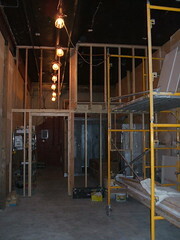 here are more photos of the construction and all of the glorious progress.